Do you see the jetliner? Remove any one of the pixels in the above image and there would be a hole in the whole (photograph). It wouldn’t be complete. It wouldn’t be the same photograph. Some might say it has a flaw. The universe presents itself to us as a system composed of parts-within-wholes, of systems within systems, organized through time and evolution as interdependent levels of complexity. Each part, including you and me, is integral to the whole; and, in some holographic sense, each part is a microcosm of the greater macrocosm. Each part contains within itself the seed or template of the whole. Each and every individual pixel within a digital image is a necessary part of the whole picture—if it’s to be complete. Because pixels have unique characteristics such as size, color, luminance and value they are also individuals by virtue of their boundaries, each bearing a strong relationship to those in close proximity, less so for those farther away. Even the myriad of individual pixels so distant they appear to be unrelated are present and contributing to the whole picture. Had the above scene been photographed on film, the parts would have consisted of grains of silver halide which are “fixed” entities. They cannot be changed. On the other hand, because digital pixels are “virtual,” consisting of units of electron excitations, they can quite easily be manipulated—for instance, made lighter or darker. Whether the image substrate happens to be paper or a computer screen, photographic images are mechanical systems, constituted of parts that can be manipulated—in the developing and printing processes or using software applications such as Photoshop in the case of digital images. Scientists refer to the decision-making capability of a holon as autopoiesis or “self-making.” By our choices we constantly make ourselves, not just our experience of life. My dear friend and philosopher of science, Beatrice Bruteau, writes that “In all living systems it’s the interactive union of the parts, the sharing of their beings, their energies, that constitutes the new whole.” The sharing of their beings. Atoms unite to make molecules, moleculres unite to make cells, that unite to make organisms, that unite to make organs, that unite to make… You get the picture. Systemically speaking, whether we share, what we share and how we share our being, beyond but including what we do to make a living, makes a profound difference. This is especially so for those within our circle. But it’s also the case, by extension and facilitated by the electronic media, for those beyond it, the larger holons within which we are members—family, community, church, business, industry, nation, humanity. As members of church, community and political systems, we remake them by our everyday choices. In the above image I’m reminded that every individual, regardless of circumstances, is an integral part of the emerging picture of the human family. Every day, the quality and manner of our character, choosing and relating contributes to the making of this picture. What happens in and to one of the system’s parts also happens in and to all its other parts, and hence it happens in and to the system as a whole. This image displays a greatly enlarged section from the lower right corner of the sky image to demonstrate how individuals (holons) contribute to and constitute the larger image. To see the jet aircraft more clearly, step back from your screen about fifteen or twenty feet. 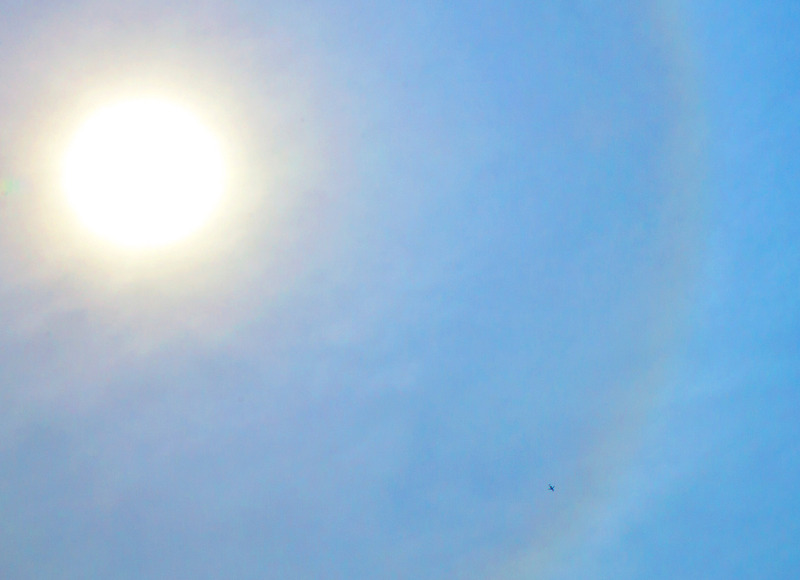 It was the rainbow-like ring around the sun that prompted me to point my camera up. Looking through the viewfinder and recognizing the speck as an airplane, my first inclination was to crop it out. But seeing that the size relationship was evocative, I decided to keep it in. After downloading the image to the computer, I zoomed in to see if the airplane was sharp. It was. 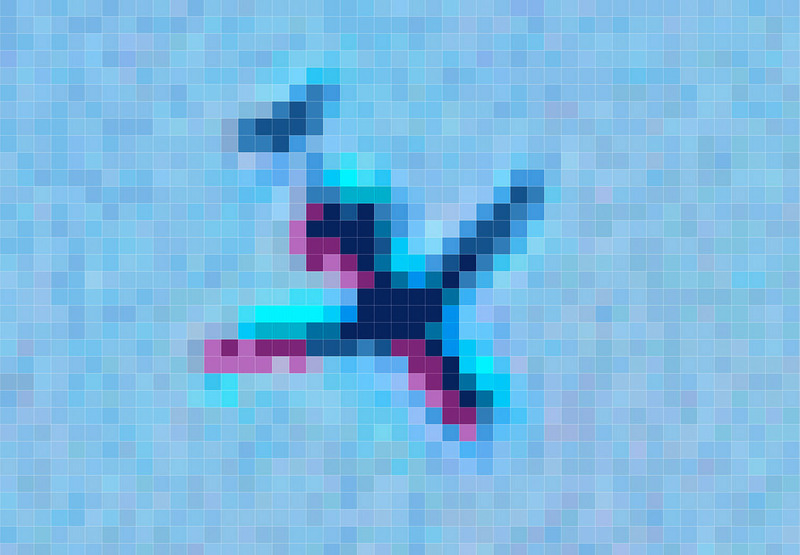 And that’s when I discovered that, by zooming in as far as Photoshop would allow, there was a clean distinction between the airplane pixels and those of the blue sky. Equally fascinating visually was seeing how the sky was constituted of many colors and values beyond medium blue. The juxtaposition of the sunburst and the jetliner, an object we consider large and carrying many people, prompted me to contemplate the nature of whole systems, part-whole relationship in particular. Bruteau, Beatrice, 1997. God’s Ecstasy: The Creation of a Self-Creating World. Crossroad Publishing Company. New York, NY. Land, George, 1997. Grow Or Die: The Unifying Principle Of Transformation. Leadership 2000 Inc.. Carlsbad, CA. This entry was posted in Part—Whole Relationship and tagged Choice, Digital, Film, Holon, Image, Living System, Parts, Pixel, Share, System, Whole. Bookmark the permalink.